Who Is Your Information Filter? Michael is hitting on something very important. In FriendFeed, not all shared items are created equal. I’ve noticed some people are really good at getting people to click through on a shared item and start a conversation. I think of these people as the new Information Filters. They have a knack for getting their subscribers to check out stuff they find interesting. More so than your average social media user. Good Information Filters can find themselves with a lot of power to direct traffic, and subtly influence what others take in when it comes to information. This isn’t without precedent. Television and the web are prior examples of this. Some people call it ‘eat your peas’ journalism because it has to include everything that’s good for you to know to be a good citizen of the world. We put it out there. In this comment, you see the larger societal obligation felt by the mainstream news media. They cover everything, even the stuff you don’t care for. There’s a tension between ensuring people get a full range of information about our multi-faceted world, and what people are willing to pay attention to. So much internet traffic can be directed to an item linked to by Drudge that unprepared websites have been known to collapse under the strain. For politicians, the effect is akin to a needle injecting information into the media bloodstream. A positive story can give a shot of adrenaline to a flagging campaign. More commonly, negative information can be like a dose of poison being administered. The second major reason for Drudge’s influence, according to the Fix’s informal poll of Drudge-ologists is his ability to sniff out a potentially big story when others — including reporters — miss it at first glance. What do Jon Stewart, David Letterman, Jay Leno and Matt Drudge have in common? Each of these guys have emerged as a key Information Filter. New social media platforms, such as FriendFeed, are starting to see the emergence of their own Information Filters. The nature of FriendFeed is that you start to think that the world is like you, because your friends shape your FF world. I think the FF world is full of Obama supporters, and other people thing it’s full of Twitterers. Pick your friends wisely because they define your FF. The sheer number of subscribers make some people Information Filters. The big power users on Twitter: Leo Laporte, Dave Winer, Robert Scoble, Jason Calacanis, etc. These guys really drive discussions around ideas, opinions and news. If you subscribe, you can’t help but be overwhelmed by the discussions they can kick off. The reputation for finding interesting stuff is a little harder. Like Matt Drudge and Jon Stewart, you need to have a sense for what people want to know and find interesting. Some people are naturals at this, but I think anyone can learn how to identify interesting stuff. Louis Gray is a really good Information Filter. 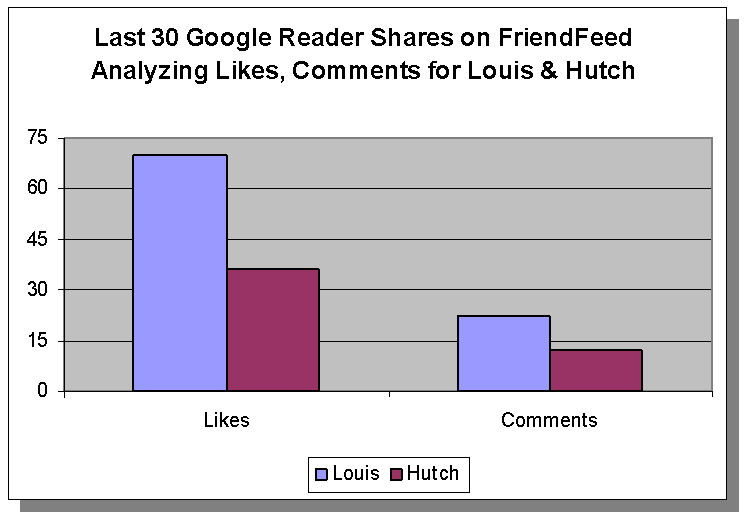 Out of curiosity, I took at look at the last 30 Google Reader shares he put into FriendFeed. And I compared them to my last 30. I wanted to analyze the interaction around them: Likes, comments. The chart to the right graphs the total Likes and comments for the 30 Google Reader shares of each of us. Louis is clearly good at putting things out there and having people discuss them. You’ll see the Likes and comments on his shares are double mine. I consider Louis to be one of my Information Filters. He’s great at identifying the good stuff. And he takes this role seriously. He wrote a post Roll Your Own Blog Leaderboard with Google Reader Trends, in which he identifies the blogs he’s sharing most often. Do you have a problem with people personalizing the news vs. you saying ‘these are the top stories’? Is there a danger in that if you give people too much personalization? Williams: That’s for others to decide. I will say that if you’re using a filter, if you wake up in the morning and you have loaded up your computer, in other words to say, ‘Foreign news totally bums me out, this Iraq thing, it just ruins my day. Keep it away from me.’ Is that what [James] Madison had in mind, do you think? Is that what [John] Adams and [Ben] Franklin and [Thomas] Jefferson had in mind? Did they expect a little more informed electorate, to quote Mr. Jefferson? Did they expect a little more from us as citizens? I can’t judge people. Democracy, on the other hand, looking at the argument, it’s their right [to filter]. I’m a lover of news and information, I’m a lover of American history, it’s my hobby. So if I had my druthers… Some people call it ‘eat your peas’ journalism because it has to include everything that’s good for you to know to be a good citizen of the world. We put it out there. I can’t start programming the ‘NBC Nightly News’ with just the news that doesn’t bum people out. Just the news they want to see and hear. But I can’t stop someone from using filters, from using pay-as-you-go technology to get what they want. I will probably have my own opinion in a couple years about what we’ve become as a society as a result of if we stop getting the news that’s at all negative. Hmm, how come you all like commenting on Google Reader Shared Items here in FriendFeed but you all do so little Google Reader reading yourselves? Check it out for a good discussion around the merits of using FriendFeed exclusively for reading new blog posts. Brian Williams alluded to the “eat your peas” element of being an informed citizen. That is, take in information even when it doesn’t interest you. But that’s really fighting against human nature. We’re time-constrained, and social media has made it easier than ever to perpetuate our natural tendency to rely on the advice of friends for what is interesting. So really, the best thing to do is to choose your Information Filters wisely. What do you think? How do you select your Information Filters? 19 Responses to Who Is Your Information Filter? I’ve been noticing the Louis Gray filtering machine and I’ve incorporated his Google Reader shares into my daily monitoring. I probably don’t filter as much as I should. I rely on FriendFeed and blog subscriptions, but I really need to try NoiseRiver. 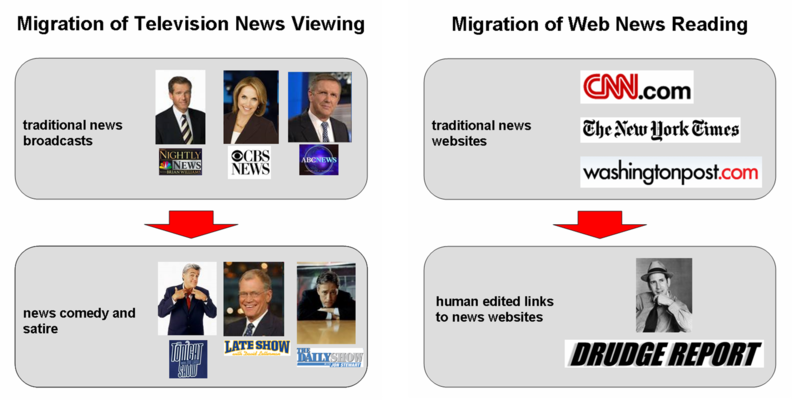 I’m curious about the comment that the top twitter-ers are news-driven. I haven’t gotten into Twitter because it seems like an endless stream of minutia from people I know. Am I missing a bigger picture here? I think “filter” is the wrong term. Using Scoble as the example, I believe Robert sees himself as a connector. So it is a kind of “editors choice” except it comes from finding that Scoble is reliable enough with regard to my own interests that his links and posts have a high enough signal to noise for my interests that following the connections he makes is valuable to me. I also notice that over time this relationship changes, where my attention is on other things than what attracts Robert’s attention. I may still keep an eye on his river of connections, but I follow fewer of his links and I find myself connecting with others more. There are obviously other factors, including the clubhouse nature of the social cluster around Scoble’s internet presence. Need a better term than “filter” is all.